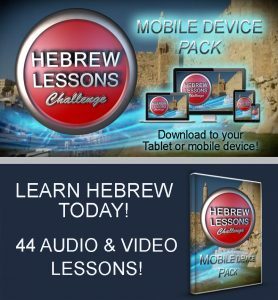 Thousands are enjoying the Hebrew Lessons program we have developed and have asked for the digital downloads in Video and Mp3’s for your Smartphones and computer and portable tablets. All in HD and great for Apple TV. Great News – with this portable device pack you can learn on the go in the car, airplane and in locations where you cannot access the internet. Use as a stand alone learning program or add it to the online version to access even more learning tools! The lesson parts have been joined together so you can loop each lesson and go over and over till you master each lesson. This pack contains additional lessons not on the online program.